Mike Judge has long established himself as a gifted storyteller, from backyard tales of King Of The Hill to the dystopian stupidity of Idiocracy to a bunch of too-smart-for-their own-good developers in Silicon Valley. But as it turns out, Judge is pretty great at telling other people’s stories as well. 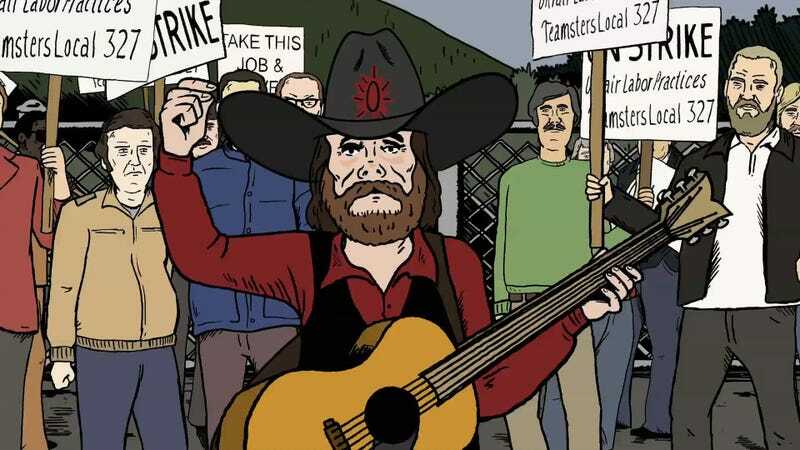 In his new Cinemax series Mike Judge Presents: Tales From The Tour Bus, he mines storytelling gold from the people who grew up with and performed alongside a number of country music legends, resulting in a wholly engaging series that even non-country fans should love. Anyone with dads or grandpas who love to sit around the fire and tell tall tales from their youth should be familiar with this kind of setup (just ask my dad’s friend Brady about the time he wrestled an orangutan at a state fair for $200). The legends that Judge features in his series—the first few episodes alone feature familiar names like Jerry Lee Lewis, George Jones, Tammy Wynette, and Johnny “Take This Job And Shove It” Paycheck—are already larger than life. Interviews with longtime country music staples like the Adams brothers—who played backup for Jones and Paycheck, among others—offer an invaluable and humanizing behind-the-music glimpse of backstage shenanigans and barroom fights. 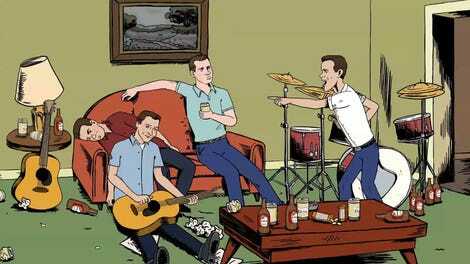 The animation then helps bring the stories to life in a way straight interviews couldn’t, underlining the tragic hilarity of alcoholic George Jones taking his riding mower to the bar after his wife Wynette threw all of his car keys into the bushes (one of the Adams brothers crows gleefully, “He didn’t even take the blade off!”). Or Jerry Lee Lewis letting off a few rounds from a machine gun to wake up his passed-out partying buddies, resulting in the destruction of a wall of false teeth in the dental office next door. But you may have seen some of these Jerry Lee stories already in the Dennis Quaid/Winona Ryder biopic Great Balls Of Fire (that is, if you could sit through it), and the saga of Jones and Wynette was played out on the country music charts themselves, from her hits “Stand By Your Man” to “D-I-V-O-R-C-E.” (The former spouses united for the poignant “Golden Ring”; shown here in live concert footage, neither singer could keep the tears away.) Someone like Paycheck may benefit the most from Judge’s unusual and creative treatment here: Writer of a multitude of hits, including Wynette’s first, his most famous song actually led to a rise in the unemployment rate and was made into a movie. But the long-troubled PayCheck was inevitably headed for prison, at a time when his haunted looks had him billed as country music’s Charles Manson. He cleaned up there, and had a new lease on life in his later years. His friend Ernie recalls Paycheck writing one of his best songs ever toward the end of his life, “Old Violin,” and starts weeping. Judge picks this moment to let the animation fall away to actual footage—the man’s crying becomes real and even more affecting. Judge himself narrates the series, leading off with an animated version of himself on the tour bus, holding an album cover of the artist in question, with a tease toward jail time, shootings, attempted murders, etc. Those sensational tabloid triggers offer a captivating hook, but they’re almost not needed. The tales from Judge’s animated cast of characters so easily tell themselves, bolstered by vintage concert, TV, and—in Paycheck’s case—courtroom footage, with animated guest stars like Sam Phillips and Johnny Cash popping up in the stories. These legends then soon grow as tall as Paul Bunyan carving out the Grand Canyon with his ax. Even if you’re not a country-music follower, Judge’s stories of epic rural grandeur are well worth seeking out—and don’t be surprised if you find yourself a fan by the time the tale is over.